Are you providing the best resident care? 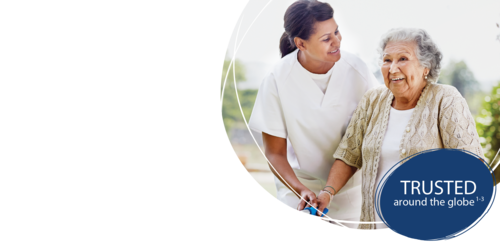 Contact TENA® for a personalized consultation to learn how our products and services can help you deliver the best possible care. Using TENA® products and routines could result in improved quality of life for residents, while allowing care home staff to spend less time managing continence care and more time with residents. TENA® offers a comprehensive set of clinical tools and solutions, supported by our industry-leading clinical team of registered nurses to help you assess, benchmark and improve key performance issues. 1Study involving 924 respondents (depending on question) from Canada, France, Germany, Italy, Sweden, UK and the USA. Results vary across countries. Kantar Health. LTC Brand Audit Study. August 2014;1-106. 3TENA provides products and solutions for consumers and professionals in more than 100 countries; SCA Data on file.